Gametophytic thalli stiff, erect, flattened, 10-40 mm tall, 1-2 (3) mm wide, several times dichotomously or irregularly branched, brownish-red to dark red. Several to many axes arising from a common crustose holdfast, often giving appearance of a rounded tuft. Distal branches often incurved. 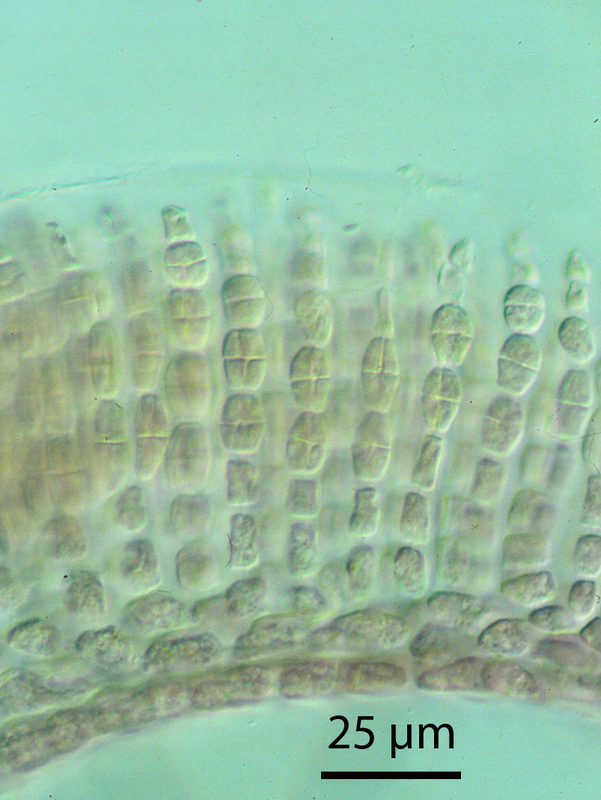 Carposporophytes immersed, cystocarps hemispherical and projecting from the thallus surface, with one microscopic, terminal ostiole (when mature). 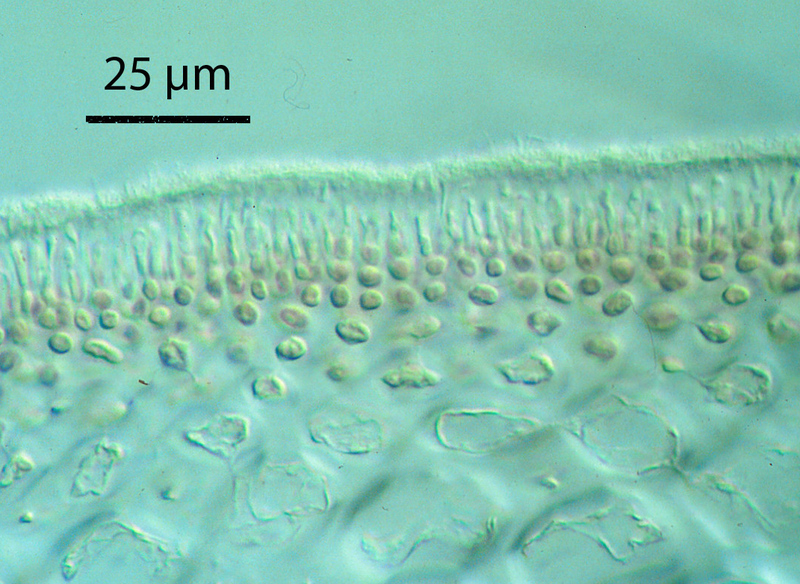 Sporophytes crustose, comprising a monostromatic basal layer that produces erect filaments dorsally (Anderson & Bolton 1990). Tetrasporangia cruciately divided, developing in a chain-like series several cells below the surface of the crust. Crusts red, closely adherent to substratum. Found from Namibia to Goukamma (1-29). Often occurs in sand-affected areas: crustose holdfasts and tetrasporophytes shown to survive long periods of sand-burial (Anderson et al. 2008). World distribution: Also found in Namibia: Southern African endemic. Type locality: Cape of Good Hope (Silva et al. 1996). Notes: 1. South Coast specimens appear to be smaller in general than many on the west coast of South Africa (as described in Stegenga et al. 1997). 2. Based on a DNA study, Fredericq et al. (2003) considered Ahnfeltiopsis glomerata to be synonymous with Gymnogongrus dilatatus. 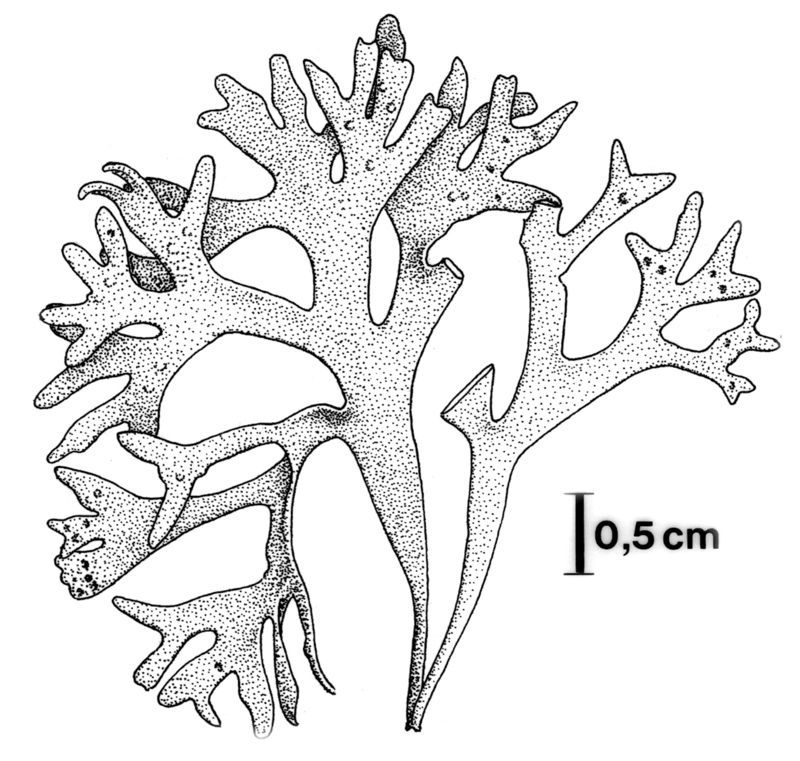 However, we maintain G. glomeratus as a separate species because all the S coast specimens we have found clearly fit the description of this species, and specimens fitting the description of G. dilatatus do not appear to occur here. Gymnogongrus glomeratus, with Ulva sp in the background. 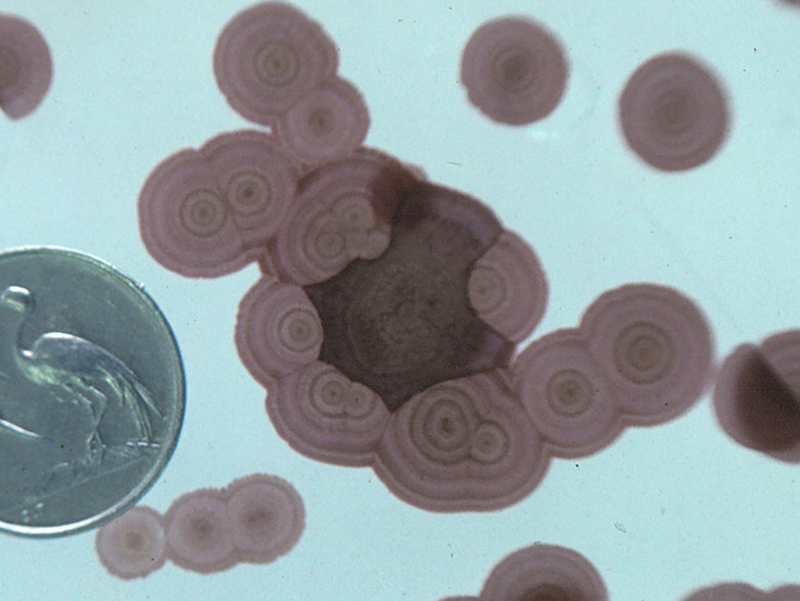 Gymnogongrus glomeratus, XS of thallus showing small cortical and large medullary cells. Gymnogongrus glomeratus, XS of blade and two cystocarps. 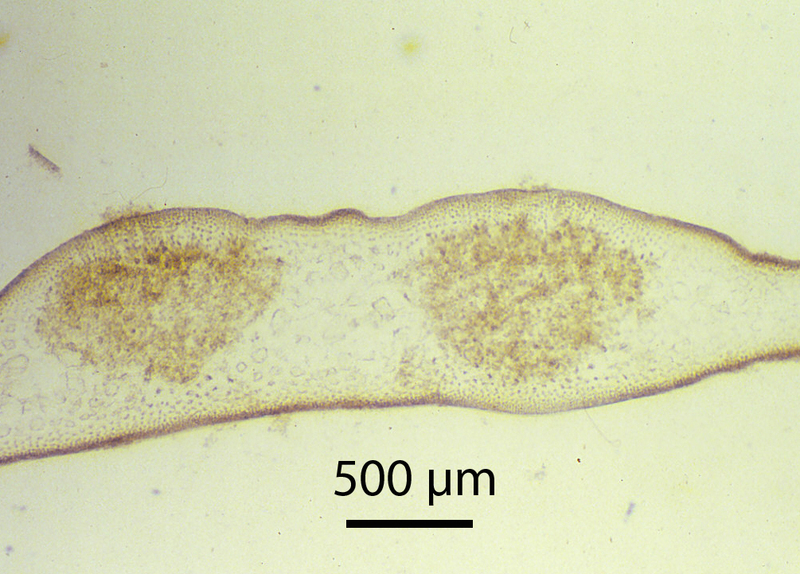 Gymnogongrus glomeratus, XS of outer region of male thallus showing peripheral layer of colourless spermatangia. Gymnogongrus glomeratus, crusts of young sporophytes grown in culture (coin ca 15 mm in diameter). 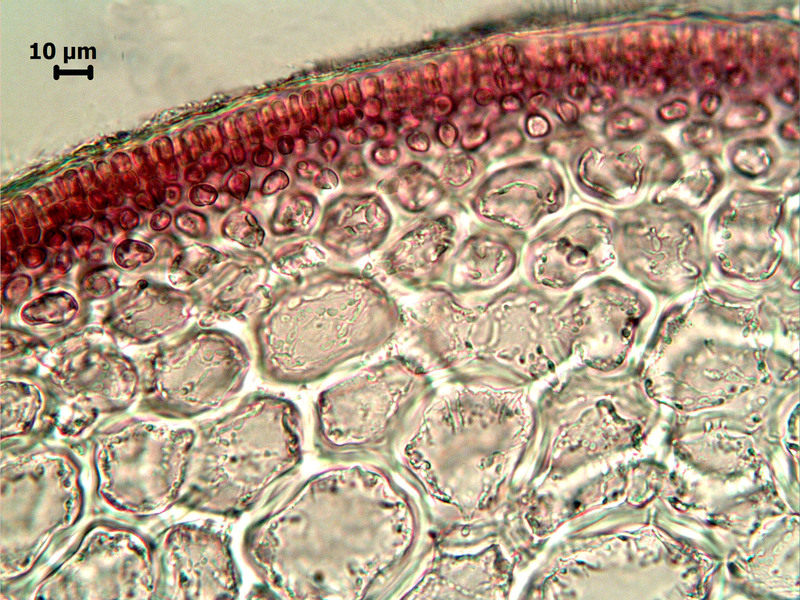 Gymnogongrus glomeratus, cross section of cultured tetrasporophytic crust showing adherent filaments of tetrasporangia. Gymnogongrus glomeratus, habit. Reproduced from Stegenga et al. (1997)(as Ahnfeltiopsis glomeratus). Agardh, J.G. 1849. Algolosgiska bidrag. Öfversigt af Kongl. Vetenskaps-Adademiens Förhandlingar, Stockholm 6: 79-89. Anderson, R. J., Anderson D. R. & J. S. Anderson. 2008. Survival of sand-burial by seaweeds with crustose bases or life-history stages structures the biotic community on an intertidal rocky shore. Botanica Marina 51: 10-20. Anderson, RJ, and JJ Bolton, 1990. 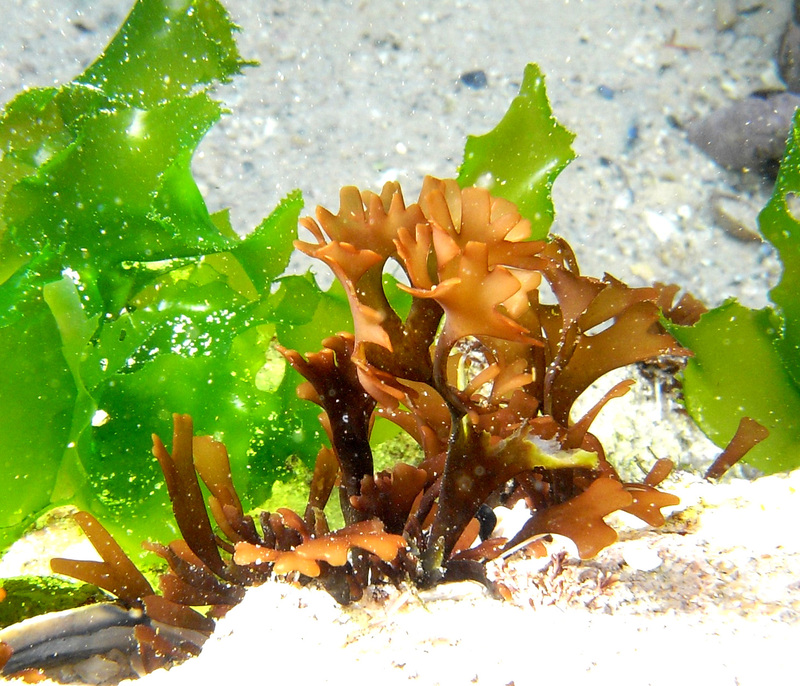 Reproductive morphology and life histories of southern African Gymnogongrus species (Rhodophyta, Phyllophoraceae). British Phycological Journal 25: 381-390. Fredericq, S., RJ Anderson & J. Lopez-Bautista. 2003. Systematic circumscription of some Phyllophoraceae from the Cape region, South Africa, based on morphological and molecular evidence. Proc. 17th International Seaweed Symposium, Oxford University Press, pp. 263-273. Stegenga, H., Bolton, J.J. & R. J. Anderson 1997. Seaweeds of the South African west coast. Contributions from the Bolus Herbarium 18: 655 pp.